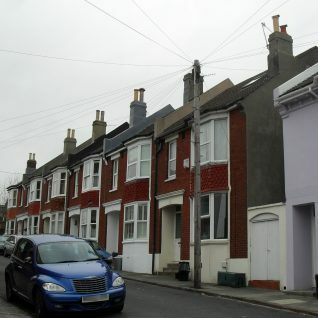 Houses at the north end of Belton Road, Round Hill; built in the early 20th century of brick, unlike the stuccoed houses found in the rest of the suburb. Some bricks came from the former Tower Mill which stood on the site until its demolition in 1913. I grew up in Belton Road, in the Roundhill area, in a small Victorian terraced house. At the front of the houses were one or two steps. Houseproud neighbours would kneel down and spend a lot of time scrubbing their steps with Vim – a fairly harsh cleaning product. Having clean steps seems to have been a sign indicating that you were both clean and organised. I don’t think we ever cleaned ours. At the back of the house was an outside toilet. A drafty affair, especially in the winter. Early toilet paper consisted of torn up editions of the Evening Argus, threaded onto a piece of string. Later, we moved up in the world to Izal. Izal was an incredibly tough and very rough paper that made me wish that we had gone back to the Evening Argus. For some reason, when we were going to the outside loo, we declared that we were ‘Going out the back’. My father kept an old copy of the Bible in the outside loo. He was a Pastor in his own Pentecostal church and wrote some of his sermons there. This probably is not as daft as it sounds. The inside of the house was noisy, with little privacy or relative silence. Certainly odd, though. I wonder if you had an outside loo? Do you remember Izal? Share your memories by posting a comment below. I lived at 18 Blucher Place on the carpark in the centre of town, which was knocked down to make way for the Churchill Square development. We had an indoor loo, but my nan, grandad and uncle who lived at 21 did not. Philip is spot on with newspaper being used, an early form of recycling. Blucher Place, Cannon Street and Artillery Street were built in around 1825, all named after the battle of Waterloo. Being in the town centre, meant that we were so close to all the amenities, especially all the cinemas. The Regent, Academy, Essoldo, Curzon just to name a few.